In centuries past, human beings lived difficult, labor-intensive lives in deferment to monarchs and landowners, paying dues to these rulers for the simple privilege of having a roof to sleep under. Well, lucky for us, we've come a long way since feudalism (for the most part). Many of us can now expect to have a roof over our heads without being entirely indentured to another individual. Unfortunately we are still indentured now, but in a different way. Due to the catastrophic effects of major energy–producing industries, we suffer from diseases ranging from asthma to cancer, accidental malfunctions like Fukushima's nuclear disaster and the Gulf of Mexico Oil spill, and even, as some research indicates, earthquakes caused by fracking. You may think hydropower is somewhat less devastating on a global scale, but try telling that to the millions of poor people in India and China summarily displaced from their ancestral lands to make way for huge tracts of water stored by mega-dams. And as for wind-generated energy: It is clean, but somewhat inefficient when you think of the amount of effort, land, and capital it takes to generate energy from wind turbines. Severe weather is the number one cause of power outages in the United States. John Mulcahy-Morgan from Solar Maximum informed me that these outages cost the economy between $18 and $33 billion every year in lost output and wages, spoiled inventory, delayed production and damage to grid infrastructure. And, even though the electric grid is an engineering marvel, its aging infrastructure requires extensive upgrades to effectively meet the nation’s energy demands. Through the Recovery Act, the government invested about $4.5 billion in grid modernization to enhance the reliability of the nation’s grid. Long story short, we're losing huge amounts of money and efficiency to the grid. 2. Don't Think You Can Afford Solar Panels? The Government Will Help You! Get this- because of our overburdened electrical grid, the government actually wants you to get Solar Power. Through a number of government Incentives, you can easily buy and install solar panels on your roof without spending a dime of your own money. This means a great many grants, loans, rebates, tax credits and tax exemptions are just waiting to be put towards residential solar panels. 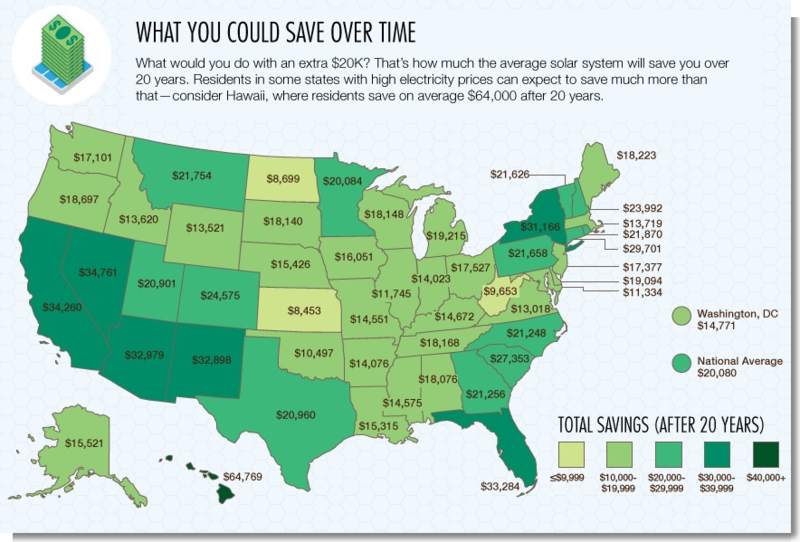 This graphic from costofsolar.com says it all: Monthly bills for solar power are way cheaper. To give you a little more perspective, the average projected savings for Americans with solar panels after 20 years is $20,080. That's a lot of cash! You even get money when your extra solar-generated energy is fed into the Grid! We must bear in mind the costs of energy brought to us through oil, coal, and electrical companies. The lives lost, the damage to the planet, and the billions spent on government subsidies and lobbying make one wonder why these other means of energy production are still even legal! So let’s go solar. It’s comparatively cheap, the planet can recover, and guess what? Nobody gets hurt!